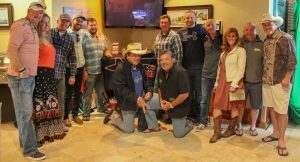 NAPLES, Fla. (March 14, 2018) – The inaugural Redfish Round-Up raised over $150,000 this past Friday and Saturday, March 9-10, 2018. 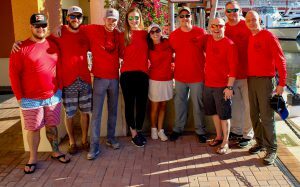 Held at Walker’s Hideaway Marina of Naples, the Redfish Round-Up raised money for Hope For The Warriors, a national nonprofit dedicated to restoring self, family and hope for service members, veterans and their families. Featuring a kick-off party, silent auction and fishing tournament, the event brought together anglers, service members, celebrities and the Naples community in their support of our nation’s heroes. The 2018 Redfish Round-Up was co-hosted by Jimmy and Christine Walker of Walker’s Hideaway Marina of Naples, as well as NASCAR Camping World Truck Series Champion Mike Skinner and his wife, SiriusXM NASCAR Radio host, Angie. 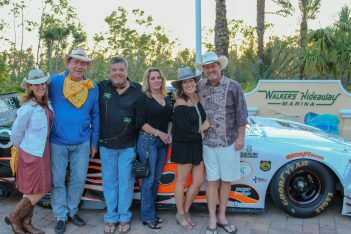 The merged concept allowed the Skinners’ Round-Up for Charity brand to continue since its 2005 inception, while bringing a new “five-o’clock somewhere” feel to the event with the Naples venue and fishing tournament concept provided by the Walkers. Furthermore, the setting and activities allowed the event to highlight Hope For The Warriors’ Outdoor Adventure program and the therapeutic benefits that service members, veterans and their families find through outdoor adventures and outdoor sports. Hope For The Warriors created its Outdoor Adventures program in 2010 to provide adaptive opportunities for wounded heroes to participate in outdoor sporting activities. In 2012, the program expanded to also include activities for spouses and children of wounded and fallen service members. One of many programs offered by Hope For The Warriors, last year the Outdoor Adventures program hosted nearly 40 events across the United States. Founded in 2006, Hope For The Warriors is a national nonprofit dedicated to restoring a sense of self, family and hope for post 9/11 veterans, service members and military families. Since its inception, Hope For The Warriors has served more than 19,000 through a variety of support programs focused on transition services, clinical health and wellness, sports and recreation and community development and engagement. The nonprofit’s first program, A Warrior’s Wish, has granted 180 wishes to fulfill a desire for a better quality of life or support a quest for gratifying endeavors. In addition, Run For The Warriors has captured the hearts of more than 23,500 since 2010. For more information, visit hopeforthewarriors.org, Facebook or Twitter.